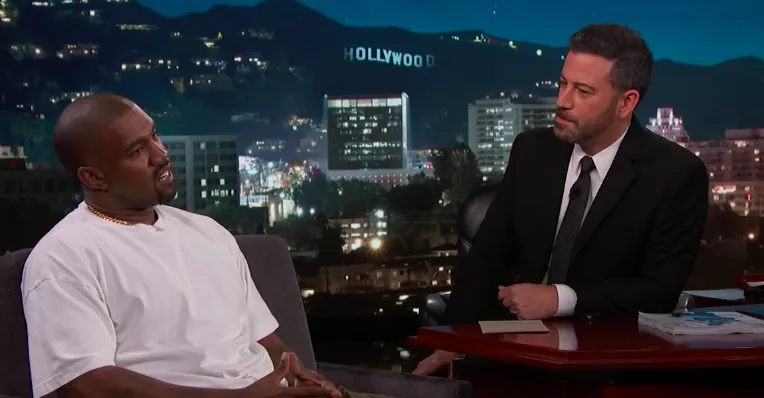 So, How Do We Feel About This Jimmy Kimmel Interview With Kanye? There’s a lot going on here so let’s just dive in. As per usual, Kanye West is a tough man to pin down. He in turns reticent, effusive, thoughtful, winsome, brash and defensive. He jokes about designing the new Space Force uniforms (not necessarily a joke?). He cautions the crowd that “everything I say is gonna be amazing” (definitely a joke). Kimmel and West’s conversation surrounds, not surprisingly, West’s recent embrace of President Donald Trump. Kimmel’s been vocal in his opposition to the president’s policies, but he and West talk in good faith here. Kimmel wants to talk specifics about Trump’s policies, while West keeps pulling back to talk about a broader, more esoteric picture. The most revealing part takes place right before the first commercial break, when Kimmel references West’s infamous “George W. Bush doesn’t care about black people,” asking if he thinks Trump does. West is uncharacteristically at a loss for words. West and Kimmel are both polarizing figures discussing perhaps the most polarizing figure of the last century, meaning you probably already know how you feel about the various topics of discussion here, as well as the people discussing them. It’s unlikely you’ll hear anything in this conversation that’ll change your opinion, but it’s notable that the conversation is happening at all.